The best place to look for information on how to publish your book for paper with CreateSpace is actually in your collection of traditionally published fiction and non-fiction. In their eBook, Building Your Book for Kindle, Amazon suggests both indenting the first sentence of paragraphs and also inserting empty space between paragraphs. A lot of Indies, myself included, made the mistake of using the same system for our paper books. It’s not the end of the world, and doesn’t look terrible, but the way it’s usually done is either using indents with no spaces between paragraphs – apart from the first paragraphs of every chapter, which are not indented, or having the spaces between, but not indenting any of the paragraphs. Amazon recommend paragraph indents of 0.5” in Kindle books, and again, a lot of us carried that figure over when we formatted for our paper books. It also doesn’t look terrible, and most readers probably won’t notice, but if you look again at your fiction collection, you’ll see that they mostly use smaller paragraph indents. To set yours, click on the little arrow to the right of the Paragraph box, and adjust the settings for both the indentation and the spacing there. Remember to select the portion of your book where you want this to happen accordingly. You might also fancy having a drop cap in the first paragraph of every chapter. 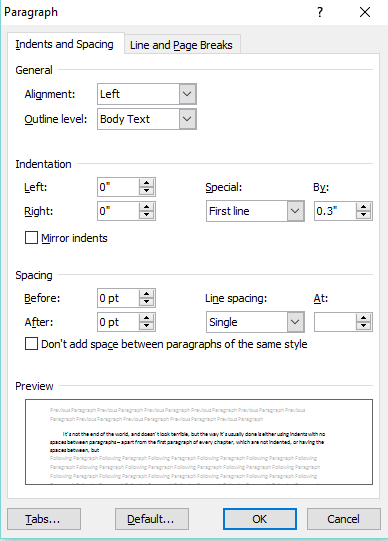 All you do in Word is highlight the paragraph and click on Insert, then select Drop Cap and choose the style you want. If you want to use a different font to the text for your drop cap, highlight only the first letter and select Drop Cap. Go back to your Home ribbon and open the font box. As you move down and hover over selections, you’ll see the end result appear on the page. If you’re looking for free and paid for new fonts, head over to Font Squirrel and download away. Always be very sure to read the licence terms for any free font, as some require attribution. Most of these fonts will embed nicely in your PDF file for uploading to CreateSpace, and if they don’t, just don’t use them. All of the standard fonts that come with Word will work great. You could also use Wingdings or other font illustrations as a drop cap with a space after it and begin the paragraph normally. Pleasure Linda. 🙂 If you get stuck with anything feel free to zoom over an email to me jorobinson176 at gmail dot com. Jo Robinson has been busy today with a post on Lit World Interviews.. more of her expertise on the subject of publishing your book on CreateSpace. For those of us who are still using older versions of Word, “Drop Cap” is on the Format menu. Thank you Christine! Which version do you use? I use 2003. In addition, when I’m forced to deal with later versions of MS Office products, I use “compatibility mode,” which disables some of the worst of the ways that the developers “fixed” software that wasn’t broken. Love the dropped cap bit – didn’t know you could do that so easily. I’ve learned this hit or miss! I do like the dropped caps and the variety of fleurons (I like to change them up!) The one thing I would recommend that users check their margins carefully. I had to widen the inner margin of each page because the binding swallowed the words on that margin. Thanks so much, Olga! Hi Jo! I love the look of drop caps, I use them on my blog, but I’m sure I read somewhere that they can mess up the formatting for ebooks, so are best avoided. Am I imagining things? I think its just the way my theme is set up. I get a lovely drop cap for my first para, and only the first paragraph. But sometimes it doesn’t seem to work, for example if I post an image at the top of the post. But then if I add a caption to the image, the first paragraph gets its drop cap. If there is no image, or a header image, I get a drop cap. I am bemused by this, so I just enjoy it when it’s there lol! My theme is Scrawl, it’s a free one, and I have to say, I love it! I found this so practical and helpful for writers.